If you want your home to look large, then start by creating an outdoor with pavers installation. Usingpatio pavers with unique designcan help make your place unlike anything else.But, a slighterror can ruin days ofeffort when choosing an inappropriate landscape design. Incorrect landscape design can be prone to drainage issues and uneven settling, which could potentially compromise the foundation of your home, not to mention having an unattractive blight in your property. The space outside your home exudes versatility. There are many different ways that you can use your patio. Make use of the right pavers along with other hardscapes to make space become one. When it comes to pavers installation,you want to it be part of cohesive landscape design. To achieve this, you need to repeat a pattern from your garden design or from the architecture of your home. This will give your outdoor living space a flow as the pattern you use work well with other outdoor elements. There is a wide range of colors that are available for you when creating the design for your patio pavers. You can make the most of it, but be sure to choose them accordingly. Use the hues inside your house or the ones in your surrounding landscape. You can repeat some accent colors in your pavers design to create a strong statement. It is possible to customize your outdoor space by using personalized artwork. Add extraordinary crafting ideas to breathe new life to your patio. You may ask other family members to craft their own pavers that will work on the overall design. For example, you can add images onto the pavers to make them as the design. You can extend your living space to your patio landscape with the right ideas. To maximize the space in your patio area, you can put a customized fire pit, barbecue pit, dining area, or seating area. 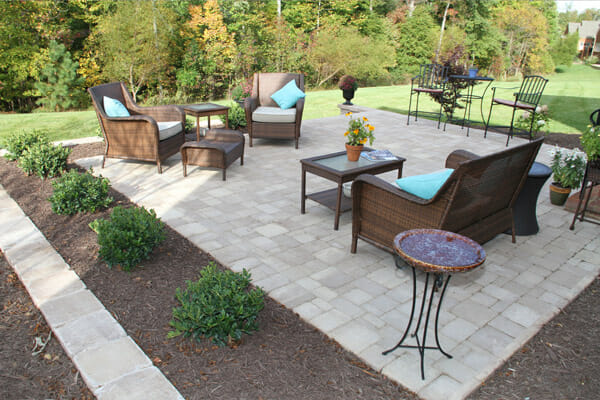 You may opt to use a mix of pavers to enhance your patio space. Only your imagination is the limit. Try to mix the shades found in one stone, and create a cool design out of them. Make sure your custom pavers installation will attract the attention of other people. You do not have to put all your effort and time to your patio paver project. You can start with a small-scale patio paver project that could be completed in a day or two. It is easy to work on a smaller space as you gradually go through the process. As you choose the design of your patio living space, remember to consult a pavers company to help make your ideas a reality. Do not hesitate to ask the right questions to the patio paver firm.